It's cheerful, chic and classic. 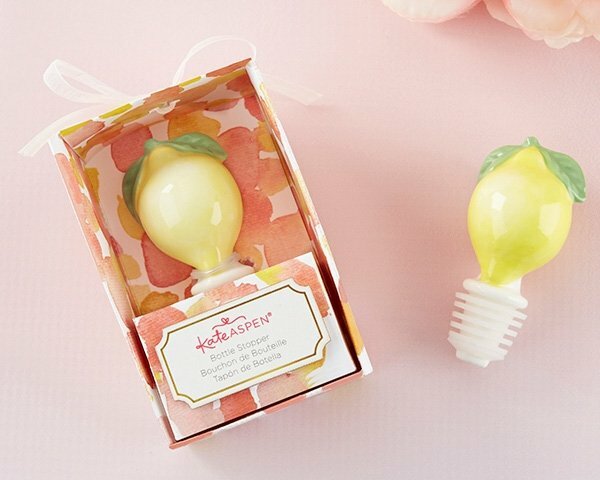 Kate Aspen's Ceramic Lemon Bottle Stopper is a great favor choice for weddings, bridal showers or even baby showers. 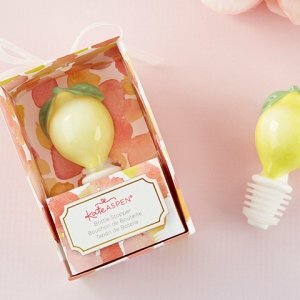 Locking in flavor and freshness of your favorite bottled items, this bottle stopper features is topped with a ceramic lemon and green leaf accent. Wine bottle stopper with rubber gasket white base and ceramic yellow lemon on top with green leaf detail. My client is going with the main squeeze theme. She wanted s sample of the lemon wine stopper. Unfortunately the Ceramic Lemon Bottle Stopper comes to us in packages of 6, so we’re not able to break them down further. I apologize for that.